Just in time for the King’s Fall Raid on hard mode. Today, as we celebrate Xur’s arrival, we have other good news to get excited about as well. Today, October 23, 2015 is also the release date for the Destiny: The Taken King, King’s Fall Raid on hard mode. The recommended light level for this new challenge is 310 so if you’re not there yet or not even close, you might want to continue to run the King’s Fall Raid on normal mode for a while until you get your light up. That being said, guardians are always welcome to test their luck and wager their lives against the odds. Since Xur doesn’t sell his exotics at 310 light, it won’t be wise to take your new items into the King’s Fall Raid on hard mode right away. But if you have extra items and exotic shard lying around that you can use to infuse what you buy from Xur right away then they just might be worth taking into the raid after all. Regardless of whether or not you’re even thinking about Xur and his items in relation to the King’s Fall Raid on hard mode, if you wound up here on this post, then you’re probably still wondering where Xur is and what he’s got in store for us. Don’t worry. We’re getting to it. This week Xur is located at the Tower. Specifically, he is down the stairs in the Hangar area in the lounge near the jukebox and emotes collection area. Up first, for Titans, Xur is selling the beautiful Empyrean Bellicose helmet. Aiming weapons while in the air will hold you in place for a short time, and Orbs collected while your Super is full will recharge your melee ability. 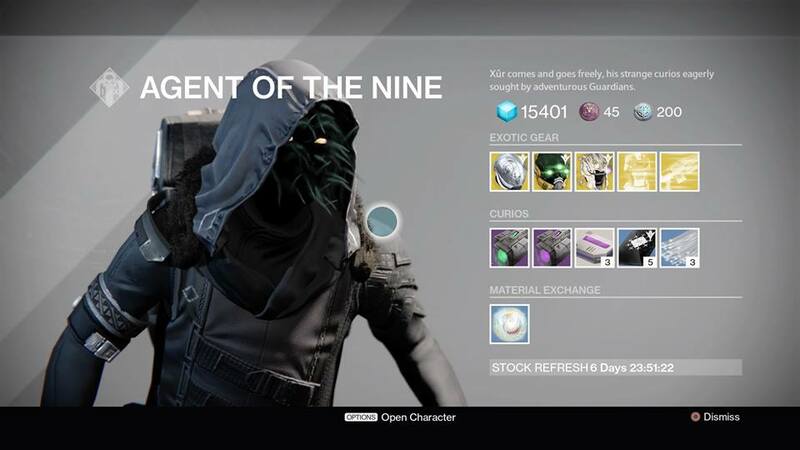 For Hunters, Xur is selling the Mask of the Third Man helmet. Arc Blade attacks use less super energy. For Warlocks, Xur is selling the fearsome Skull of Dire Ahamkara helmet. Take reduced damage while using your Nova Bomb. Improved Siphon abilities. Xur has no featured exotic weapon this week. However he does have a year two exotic chest engram and a year one heavy weapon legacy engram. In addition to the above, Xur is selling the void drive, emerald coil, heavy ammo synthesis, three of coins, and his newest item, glass needles. You can also exchange strange coins for motes of light if you wish.